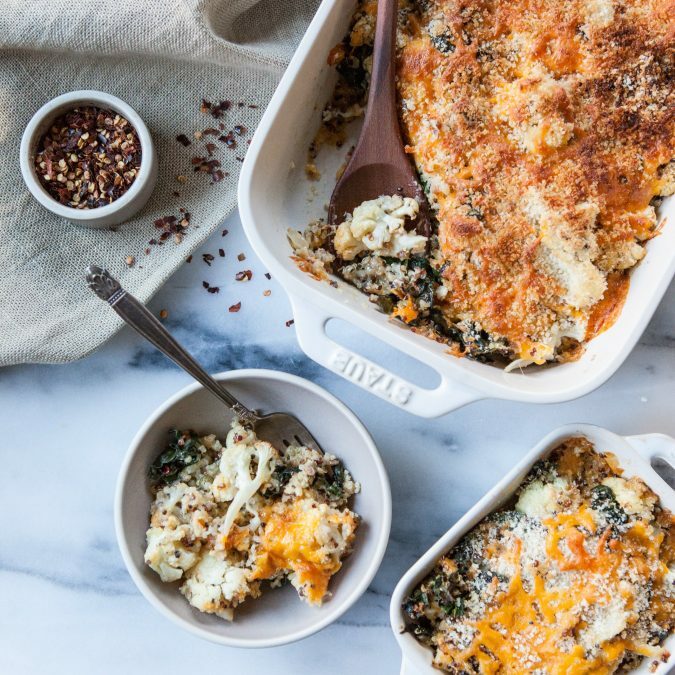 To make this a weeknight recipe, cook the quinoa and cauliflower the day before (or even a few days before) so then you’ll really just be cooking down the greens, assembling and getting the casserole in the oven. You’ll notice I cook the quinoa in broth here, a great way to add an extra boost of flavor to your savory cooking. Preheat the oven to 375 F. Line a large baking sheet with parchment paper or a silicone baking mat. While the oven’s preheating, cook the quinoa: Add quinoa and vegetable stock to a medium saucepan over medium heat. Bring to a boil, reduce the heat to low and cover, and simmer for 12-15 minutes, or until the water’s absorbed. Remove the pan from the heat and allow to sit, covered, and steam for ten minutes. Fluff with a fork. Lay the cauliflower onto the baking sheet and toss with 2 tablespoons olive oil and a pinch of salt. Roast for 20 minutes, or until cauliflower is tender (it’s ok if it’s not super roasted looking; it’s going to continue cooking when you bake the casserole). In a large saucepan over medium heat, add the remaining tablespoon of olive oil and the shallot. Cook for 3 minutes, or until shallot is translucent. Add the garlic and cook for 1-2 minutes, or until fragrant. Add the kale and saute until wilted, 2-3 minutes. Turn cauliflower out into a large mixing bowl. Fold in the kale, quinoa, 1/2 of the cheese, milk, capers, Dijon, salt, red pepper flakes and thyme. Mix well. Scrape mixture into a large oven-safe baking dish. Top with breadcrumbs and remaining cheese. Bake for 22-25 minutes, or until cooked through and golden brown on top. If you’d like a crispier top, turn the broiler on high at the end of your cooking time and continue cooking for 2 minutes, or until nice and crispy. Leftovers are great if covered and refrigerated for up to 4 days.